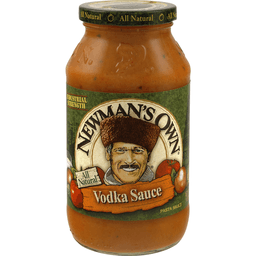 Newman's Own® Pasta Sauce Vodka Sauce. No sugar added. Made with extra virgin olive oil. Net Wt. 24 oz. (1 lb. 8 oz.) 680 g. Gluten free. Not a low calorie food. BPA free. US 8,444,002; 9,023,446; 8,507,063. Visit www.newmansown.com for more food information. ©2017 No Limit, LLC. 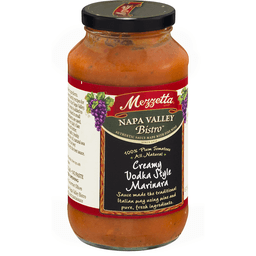 Mezzetta® Napa Valley Home Made™ Parmesan, Asiago & Romano. All natural sauce. Sweet & rich plum tomatoes. Italian roots. California soil. From our kitchen to yours. Real food: 100% Jand-selected plum tomatoes. No added sugar. No paste. No shortcuts. Real farmers: Committed to farming the highest quality ingredients, without compromise. Real family: Family owned and operated for over 80 years. Real recipe: Made in the Italian tradition from our Napa Valley kitchen. Real good: Pull up a plate and taste the difference. Get inspired at mezzetta.com. Mezzetta packaging is 100% Recyclable. GF, gluten-free. No added sugar. No paste. Please recycle. All natural authentic recipe. No preservatives. This sauce is loaded with the good stuff - cream, tomatoes, olive oil, fresh garlic and spices. It's smooth, delicate and rich. 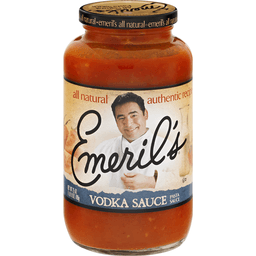 - Emeril.